I ‘ve felt very unproductive these past two weeks. I’ve been working on a pattern test (my part is over but I’m not done working on it for myself) and I printed a pattern for an easy dress (Colette Laurel) that seems perfect for some Nani Iro double gauze I have. Only I can’t seem to muster much energy for the fitting and muslin. So I’ve been sneaking in some knitting instead. Which is how my blanket has gotten to here. I look at it and it doesn’t seem bigger but it is. I get excited about switching colors, asking myself which one of my leftovers will be next, which one would keep the balance… Only that grey I’ve just started is a big leftover so I don’t have as much drive for it. I started something new instead. 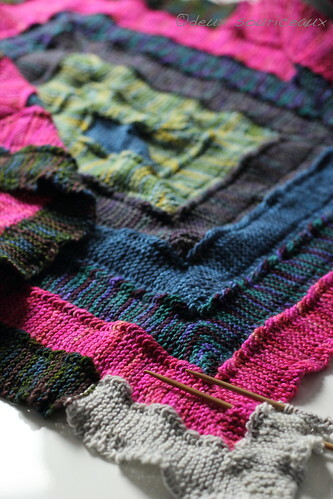 It’s only just the beginnings of the swatch but it’s supposed to become a Dahlia cardigan. I loved that pattern when it first came out, waited a while, bought yarn for it (Blue Moon Fiber Arts Seduction in Cranberry Bogged), and then waited. Thought it was about time I worked on it. The color is a lot more muted than I expected it to be. We’ll see whether that’s a good thing or not… It has a lovely shine though. Not pictured is the yarn that I wound to make socks. It’s for the travelling we’ll be doing this year. I’m trying not to get started too early or I’ll be done before the train even leaves the station. Hay! Even if I don’t actually finish it before Winter, maybe it’ll be big enough to keep me arm while I’m knitting it! ‹ Photo Monday – Guess Who Got a New Bike! 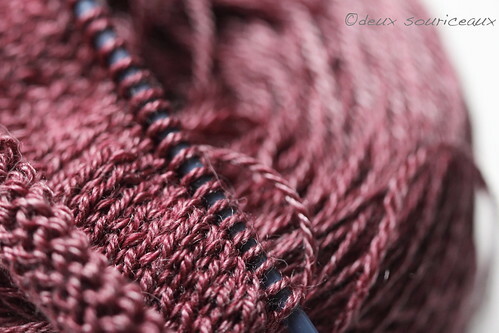 Ooooh, that Dahlia cardigan is going to be gorgeous! I like the color, I think it will work well. 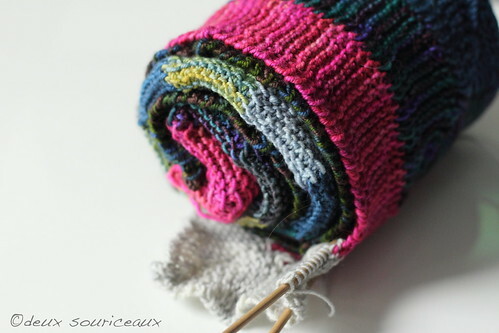 That blanket is coming along nicely too! Thank you so much! I will answer the questions soon. I can not knit and have no real drive to do so, but I do think that muted color for your dahlia cardigan is friggen gorgeous!! I’m usually more drawn to saturated colors but I think the muted color will work well with my brighter tops. I can’t wait to finish it!